Ernesto "Che" Guevara, the iconic Argentine revolutionary and T Shirt model, is about to gain a new wave of fans with the release of Steven Soderbergh’s "four-hour Spanish-language epic Che". Former Romanian Lt. General Ion Mihai Pacepa is the highest-ranking intelligence official ever to have defected from the Soviet bloc. He had intimate knowledge of the people who turned "Che" from a psychotic mass murderer into the idol of millions of wannabe revolutionaries and vapid trendies. In an article in Frontpage Magazine Pacepa explains how the KGB turned a failed, cowardly and much flawed revolutionary into a hero. Hollywood is kicking off 2009 with a monumental deception: Steven Soderbergh’s four-hour Spanish-language epic Che, rendering a sadistic Marxist killer as, according to the New York Times, a “true revolutionary through the stations of his martyrdom.” The word “stations” suggests the adoration of Christ in the Stations of the Cross. The movie’s protagonist, Benicio del Toro, does indeed compare “the Cuban Revolution hero Ernesto Guevara” with Jesus Christ. The Castro brothers, who feared any liberalization, decided to just plaster a romantic revolutionary façade over their disastrous communism, which was starving the country. They chose Che as poster-boy, because he had been executed in Bolivia, at that time a U.S. ally, and could be portrayed as a martyr of American imperialism. “Operation Che” was launched to the world by the book Revolution in the Revolution, a primer for communist guerrilla insurrection written by French terrorist Régis Debray, which praised Che to the skies. Debray dedicated his life to exporting Cuban-style revolution throughout Latin America, but in 1967 a Bolivian special forces unit trained by the U.S. captured him, along with Che’s entire guerrilla band. In 1970, the Castro brothers shifted Che’s sanctification into high gear. 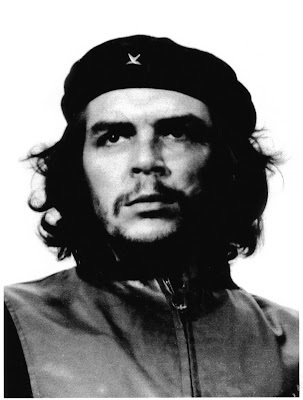 Alberto Korda, a Cuban intelligence officer working undercover as a photographer for the Cuban newspaper Revolución, produced a romanticized picture of Che. That now-famous Che, wearing long, curly locks of hair and a revolutionary beret with a star on it, and looking straight into the viewer’s eyes, is the logo advertising Soderbergh’s movie. It is noteworthy that this picture of Che was introduced to the world by a KGB operative working undercover as a writer—I. Lavretsky, in a book entitled Ernesto Che Guevara, which was edited by the KGB. The KGB entitled the picture “Guerrillero Heroico” and disseminated it throughout South America—Cuba’s area of influence. Italian millionaire publisher Giangiacomo Feltrinelli, another communist romantically involved with the KGB, flooded the rest of world with Che’s picture printed on posters and T-shirts. Feltrinelli became a terrorist himself, and he was killed in 1972 while planting a bomb outside Milan. I first heard Che’s name in 1959 from General Aleksandr Sakharovsky, the former chief Soviet intelligence adviser to Romania, who afterwards directed Castro’s “revolution” and was rewarded by being promoted to head the almighty Soviet foreign intelligence organization, a position he held for fifteen years. He landed in Bucharest with his boss, Nikita Khrushchev, for consultations on West Berlin and “our Cuban Gayane.” Gayane was the overall code name of the operation for Sovietizing Eastern Europe. At that time, the Soviet party bureaucracy believed that Fidel Castro was just an adventurer, and it was reluctant to endorse him. 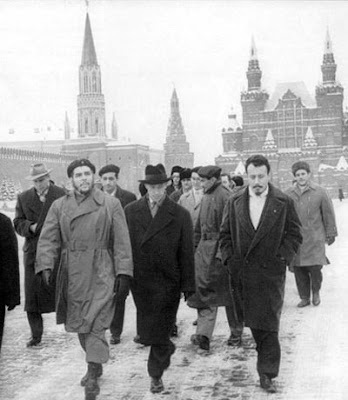 But Sakharovsky had been impressed by the devotion to communism of Fidel’s brother Raúl and of his lieutenant, Ernesto Guevara, and he made them the main protagonists in “our Cuban Gayane.” The two were brought black to Moscow to be indoctrinated and trained, and were given a KGB adviser. It is also time to stop the fifty-year-long lie, reinforced by Soderbergh’s movie, that the Castro brothers and their hangman Che were independent nationalists. In 1972I attended a six-hour public speech in which Fidel preached the same lie. The next day I went ocean fishing with Raúl. The other guest on the fishing boat was a Soviet who introduced himself as Nikolay Sergeyevich. “That's Colonel Leonov,” Sergio del Valle, my Cuban counterpart, whispered into my ear. Earlier he had identified Leonov to me as Raúl’s and Che’s KGB adviser in the 1950s and 1960s. There, on that boat, it hit me more clearly than ever before or since that the KGB was holding the reins of the Castros’ revolutionary wagon. Ten years later, Nikolay Leonov was rewarded for his handling of Raúl and Che by being promoted general and deputy chairman of the whole KGB. In the 1970s, the KGB was a state within the state. Today the KGB, rebaptized FSB, is the state in Russia, and Soderbergh’s Che is manna from heaven for its Latin American surrogates. A couple of months ago two Kremlin’s puppets, Venezuela’s Hugo Chavez and Bolivia’s Evo Morales, expelled on the same day the U.S. ambassadors to their countries. Thousands of people carrying the portrait of Soderbergh’s Che took to the streets calling for Russian military protection. Russian military ships are now back in Cuba—and newly in Venezuela—for the first time since the Cuban missile crisis. “Deception works like cocaine,” Yury Andropov, the father of contemporary Russia’s era of deception, used to tell me when he was KGB chairman. Then he would explain. “If you sniff it once or twice, it may not change your life. If you use it day after day, though, it will make you into an addict, a different man.” Mao put it his own way: “A lie repeated a hundred times becomes the truth.” Soderbergh’s movie on Che is proving both correct. Come on Trev, it's only a movie. If you'd pop you head out of the 1960s every now and then, you'd realise the left hasn't been interested in Che for years. It's the capitalists who keep digging him up to sell T-shirts and ice creams to retro kids reliving the hippie era. The capitalists would have commodified Pinochet too, a true psychotic mass murderer who made Che look like a telly tubby of mass murder compared to his exploits, but unfortunately for Pinochet he was just too dam ugly. As usual the far-left bring up the spectre of General Pinochet as a desprate distraction from teh blood-soaked history of their idols. Face it losers, the antics of your commie/socialist chums make even the crimes of Pinochet pale in comparison. And Christ I'm getting weary of pointing that out. You would have a point EXOCET if I am apologist for leftist mass murderers, but I tend to call a spade a spade and a murderer is a murderer whether they do it whatever their cause. It doesn't matter who keeps resurrecting this psychopathic mass murderer as a hero, the truth deserves telling. Good on you, Trevor, for getting this information online. Hopefully a new generation of kids who don't know who Guevara won't be sucked into believing he was a decent if misguided human being. Pinochet was also a blood-soaked murderer, but is not idolised by anybody, so I guess that's why Guevara deserves special treatment. Pinochet was a murderous thug who was convinced by Freidman yo use the free market to overcome Chile's economic woes. The reforms meant Chile stopped being a tinpot country ruled by extremists. Freidman is the Chilean hero, not Pinochet. And Che was a miserable failure - he led two revolution attempts with two complete failures.